Chocolate Macarons filled with Raspberry Ganache and Fresh Raspberries - Happy Mother's Day! alive and with only one retake. Not bad. I will retest that item in Chicago in August. I learned so much training and taking this certification, which will make me a better instructor and resource for your - my bakers. This post is all about Chocolate Macarons. I paired them with a raspberry ganache and fresh raspberries. Chocolate macarons can be a little tricky. Cocoa is a drying agent. It dries out all the other ingredients - so we have to compensate by changing the ratios of the other ingredients. There is a bit more sugar in this recipe to add moisture. These are delicious - rich and almost brownie like. If that is possible for a macaron. Watch over baking them - they can over bake quickly in the last few minutes. I paired them with a raspberry ganache which should be made the day ahead. These would make a great Mother's Day gift and for my macaron bakers - you have to add this to your repertoire. These is a contest with this post too. 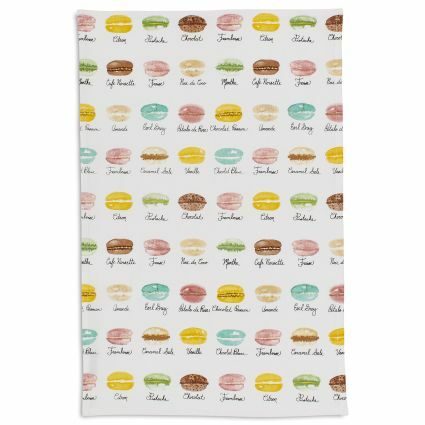 Whoever bakes and posts a photo of the finished macarons and raspberry ganache wins this dish towel. Only one winner per year, just to be fair. 2 Half baking trays lined with parchment or Silpats. Macaron Templates (optional)***please email me at BakingwithColette@gmail.com and I will send them to you. Preheat oven to 325 degrees (conventional) 300 degrees (convection). 1. Layer the powdered sugar, almond meal and cocoa in a food processor or mini-prep fitted with a metal blade. the mixture looks like fine meal. This takes about 15 seconds or 8 pulses. 1. Using a stand or hand held mixer, whip the egg whites with the cream of tartar on medium speed until they look frothy and no egg white liquid remains. They will still have a yellowish cast and no structure. 2. With the mixer running, add the granulated sugar slowly. Once the sugar is added turn the mixer on to medium high speed. 3. Continue to whip until the meringue is soft and shiny. At this stage it resembles “marshmallow fluff” or “shaving cream” and does not form a peak. 4. Stop the mixer and add color if desired and extract. Put the color on the bottom of the whisk or beater attachments. 5. Turn the mixer to high speed, whip the egg whites until the mixture begins to look dull and the lines of the whisk are visible on the surface of the meringue. 6. Now check for peak. The peak should be firm with the angle supporting the peak at 11:30. (see photo) Transfer to a medium sized bowl. 7. Fold in the almond meal, powdered sugar and cocoa in three increments. 8. Paint the mixture halfway up the side of the bowl, using the flat side of your spatula. Then scrape the mixture down to the center of the bowl. 9. Repeat 2-3 times then check to see if the mixture slides slowly down the side of the bowl. 10. Pipe on parchment or Silpat lined baking sheets. 12. Let dry until they look dull but not overly dry. **Drying time varies on humidity. In a dry climate the macarons can dry in 15-20 minutes and in a humid climate it can take 35-40 minutes. But never dry them for more than an hour. 14. Place on the middle rack of the oven. 15. Check in 11 minutes. 16. If their tops slide then bake for 2 -3 more minutes. They should release from the parchment or Silpat without sticking. Check one or two. If they stick put them back in the oven for 1-2 more minutes. 17. Let them cool for a few minutes before removing from the Silpat or parchment paper. Total time: 15 minutes – must chill or sit overnight at room temperature to achieve proper consistency. 1. Warm raspberry puree to 140 degrees. 2. In a small pan, preferably with tall sides caramelize the sugar, be careful as a small amount of sugar caramelizes quickly. 3. Remove caramel from heat and deglaze with corn syrup or glucose. 4. Add the caramel mixture to warm the raspberry puree. Stir with a heat proof spatula to combine – place over low heat and stir if the caramel has seized up. The heat will melt it back down and the mixture will become smooth. Pour over chocolate and stir gently to melt. Add butter and stir until smooth. To use the same day, pour onto a small tray lined with plastic wrap or lightly buttered parchment paper, cover and chill for 2-3 hours so that the ganache sets up. The ganache can also be left, covered, at room temperature overnight. Use the next day and refrigerate any leftovers. 1. Place the frozen raspberries in a fine mesh sieve and thaw over a large bowl. When the berries are thawed, press down hard on them to extract as much juice as possible. All that should be left are the seeds and a little pulp. 2. Add sugar and lemon juice. This should yield 170g – 180g of puree enough for the ganache recipe.